The great thing with these 'Scaped For You' Collections is that all the hard work is done for you! 'Scaped For You' Collections are ideal for those of you who just want to choose a setup and not have the hassle of having to choose the plants you need to replicate it. These collections come complete with all the plants, wood or rock needed for the aquascape you have chosen. The Collection even comes with an easy to understand diagram showing you exactly where to position the plants and materials. Layout 1 is designed for an easy to plant and maintain 250L set up making it perfect for beginners. If your aquarium is smaller than this you will have to minus plants accordingly. A forested island of Echinodorus & Vallisneria sitting in a meadow of Marsilea hirsuta. 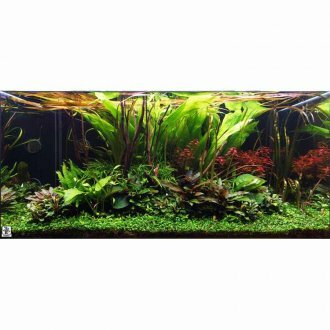 The forest undergrowth of Microsorum, Anubias, Cryptocoryne and Bucephalandra are all plants that tolerate the low light from being in the shade. As a contrast, Ludwigia palustris needs the full effect of light to ensure development of the red colour. You will also receive the hardscape materials in this plant collection and they are designed to be positioned as indicated in the diagram. Please be aware that in the majority of cases, all plants in the collection are available to send out immediately however there may be times when a particular plant is not available, we will substitute as closely to that plants as possible. For example if Alternanthera cardinalis is not available we will pick another species of this plant and if one Cryptocoryne is not available we will pick another Cryptocoryne that looks the most similar. Please note this is a special order item so depending on availability can take between 1-7 days to arrive. It also means it is none-returnable.